better flexibility, ease of operation and performance, than ever before. These are ideal for mixing and development of cultures, chemicals, solvents, assays etc. 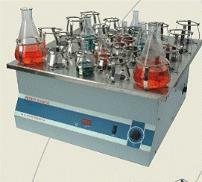 Production of basic chemicals, pathological work and various other applications. The Unit has base assembly fabricated from heavy mild steel sections. The simple and sturdy design makes the units suitable for continuous operation. �	Step less electronic frequency control ensures gentle start and maintains preset speed. �	Brushless Induction drive motor practically maintenance free. �	Variable speed from 20 RPM to 300 RPM. �	Digital display of speed with presetting facility. �	Shaking amplitude 30 mm. �	Universal Platform to accommodate interchangeable clamps of assorted sizes for different capacity of flasks. �	Automatic restart at preset speed in case of power failure.